It felt eerie to stand in a field still holding the scars of a bushfire. This area between Kleinmond and Betty's Bay had not too long ago been engulfed in flames, and these sparsely distributed proteas are really the only plants standing above ground level. While driving I also noticed how a few houses on the outskirts of Betty's Bay had been burned. It was also strange to see two houses next to each other on a burned-out mountain slope, one burned to ruin and the other untouched. 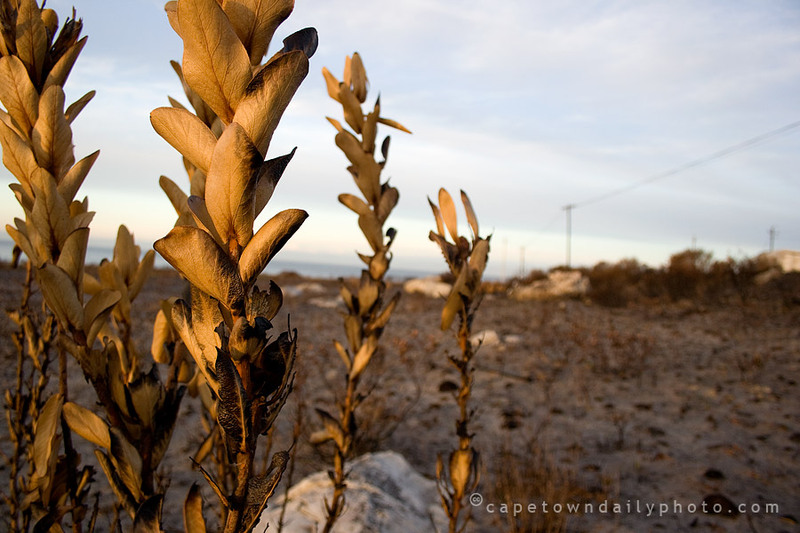 However destructive the fire was, it was interesting to note that a burned fynbos field holds some kind of beauty and appeal... this I found strange indeed. Posted in General on Sunday, 8 June, 2008 by Paul.